The product is no longer manufactured! 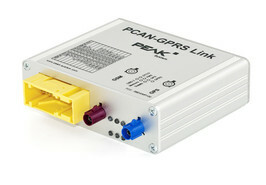 PCAN-GPRS Link is a module for recording and forwarding vehicle data. There are two freely programmable microcontrollers within the unit which process internal vehicle data. The PCAN-GPRS Link is provided as a development platform for telematic applications. An API allows simple integration within a specific application environment. The PCAN-GPRS Link supports the evaluation of FMS and Bus FMS data (Fleet Management System). This produces consumptionrelated vehicle data. The DTCO info interface also allows the connection and processing of a digital tacho with access to information such as driver identification and driver working time. The GPS module can be used to determine location and output the direction of travel. The PCAN-GPRS Link has ECE type approval (E1), which guarantees its problem–free use in vehicles. The PCAN-GPRS Link is supplied with a programming example in the form of a Linux daemon for x86 Debian. This daemon receives the data from the PCAN-GPRS Link and writes them to a mySQL database. Data can then be visualized using a php script based on Google Maps* and AJAX. Output includes the FMS and OBD-2 data and positions of all modules connected to the database. * Use of Google Maps is subject to the licensing terms and conditions as specified by Google Inc. and is only in limits free of charge. U-blox 5 GPS module with 50 channels and over 1 million correlators.